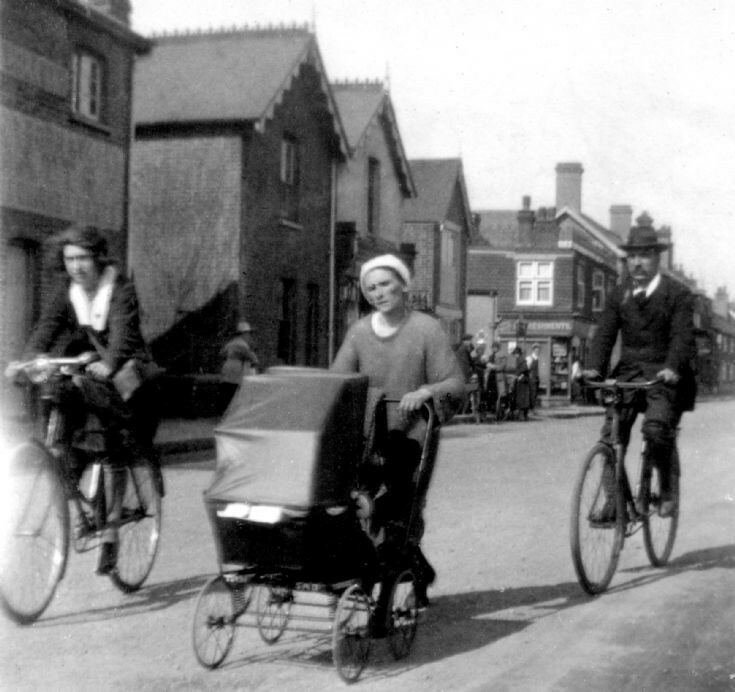 Unexpectedly, two very small photographs have turned up which show a pram race taking place in Handcross High Street. A note on the reverse suggests that it covered the route from London to Brighton, but it seems more likely that it was for a much shorter distance. The lady above looks very tired but so she would if she just pushed the pram up Pease Pottage hill. Furthermore, the second photo shows a baby in the pram! Presumably the rules stated that the pram had to be occupied. Click on Large Version to view. Beyond the two pedestrians is Roberts House which has provided a good vantage point for two ladies on the upper storey. To the left is a building which was later demolished to provide a larger parking area for the new era of the motor car. It was always known as the stables of the Red Lion, but it is interesting to note that the signage was changed to “Garage” to promote the garaging of cars. There are several pictures of this building on the website but this is the only one to display the front shortly before it was pulled down. Some years later there was great excitement in the High Street when a bullock escaped from Mr Harry Field's butchers shop opposite the Red Lion. Select Open Document to view the cutting.